Originally, I had considered visiting Serra da Canastra, another national park and hallowed birding destination in the state of Minas Gerais, after my short trip to Serra do Cipó. The park protects large swaths of Cerrado grasslands, or campo limpo, providing excellent habitat for many bird specialties as well as spectacular mammals, such as the Giant Anteater and Maned Wolf. The reserve is also one of the few remaining sites for Brazilian Merganser, one of the continent’s most critically endangered birds. Considering its impressive reputation, and the not insignificant drive from Belo Horizonte, which is over six hours, I decided to postpone my visit until Aimee could join me on a later trip. Searching through trip reports for another good birding site closer to the capital, I stumbled across the Santuário do Caraça, an eighteenth century monastery that has been converted into a lodge and nature park. Further research revealed that birders on tour through the region typically stop here for Serra Antwren, Velvety Black-Tyrant, and White-Breasted Tapaculo, and other Cerrado specialties they might have missed at Serra do Cipó, including Hyacinth Visorbearer, Gray-Backed Tachuri, and Pale-Throated Serra Finch. With over 10,000 hectares of protected Cerrado and montane humid forest habitat, including quite a few Atlantic Rainforest endemics, the sanctuary looked to be a promising as well as convenient site at just over two hours’ drive from Belo Horizonte. A multi-day stay at the sanctuary is also an excellent value, as I secured a single room with shared bathroom in the Brothers’ Wing for only R$84, including three generous meals a day (incongruously, you can also enjoy a cold beer, even a shot of cachaça, at lunch and dinner). 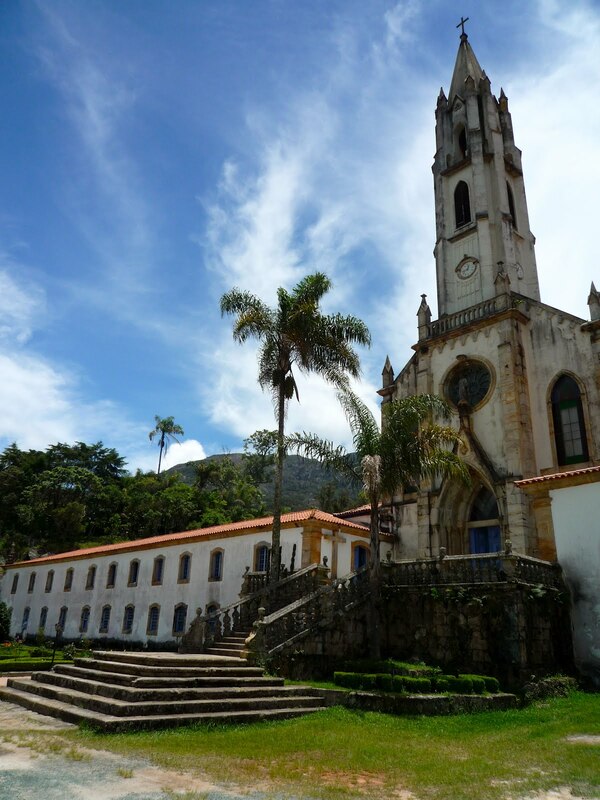 Boasting religious, historical, and natural attractions, the sanctuary is also a popular tourist destination for Brazilians, and although it was relatively uncrowded while I was there midweek, I have heard that the rooms, and the nature trails, frequently fill up during holiday weekends. Day visits for R$5 are also permitted from 7am to 5pm during the week and 8am to 5pm on weekends and holidays (one trip report I read recommended the Hotel Quadrado in nearby Santa Barbara as a good off-site lodging option). A highlight of any visit to the sanctuary is the nightly feeding of Maned Wolves. This decades-old tradition first began when monks attempted to determine which local dogs were tipping over the refectory trashcans every night. The ritual has since evolved into a major spectacle as sometimes several wolves in succession climb up the stairs and feed on piles of raw meat in front of dozens of excited tourists. Flash photography, it appears, is permitted. On the first night I was there, the wolves didn’t arrive until well after 10pm, but I surprised one in the parking lot early the following evening as I returned to my car for a flashlight. Hopefully, I’ll cross paths with another one in a less contrived setting, perhaps at Serra da Canastra or Parque Nacional das Emas. Living in Brasilia, in the urban heart of the Cerrado, I was coming to this site with a different perspective from most visiting birders, who I imagine are swinging west through Minas Gerais from the southeastern coast of Brazil. Especially having just come from a successful experience finding rocky Cerrado endemics at Serra do Cipó, I was focused on birding the humid montane forest and becoming more familiar with the sights and sounds of the Atlantic Rainforest. My targets included Serra, Dusky-Tailed, and Ochre-Rumped Antwrens, Pallid Spinetail, White-Breasted Tapaculo, Velvety Black Tyrant, and Serra do Mar Tyrant-Manakin, as well as Red-Ruffed Fruitcrow, Sharpbill, and Swallow-Tailed Cotinga, all of which are regularly reported seen. The nature park contains a network of trails that visitors are free to explore independently provided they don’t head out too far up into the spectacular hills that encircle the sanctuary. Several good trails start near the monastery itself, including the Tanque Grande and Cascatinha Trails, both of which I birded multiple times during my stay. The Tanque Grande Trail is only 800 meters long, but it passes through good humid montane forest with a well-developed understory containing White-Shouldered Fire-Eye, Ochre-Rumped Antbird, and White-Breasted Tapaculo. Mixed flocks here can be exciting and seem to linger unusually long. The Cascatinha Trail is 2 km long and passes through a wider variety of habitat, including shrubby Cerrado and montane forest with a more developed bamboo understory, which was good for Dusky-Tailed Antbird and both Rufous-Capped and Gray-Bellied Spinetails. My initial walk on the Tanque Trail started off magnificently with a mixed flock just after the entrance. Blue-Naped Chlorophonia, Velvety Black Tyrant, and Variable Antshrike were all present, while my first ever Swallow-Tailed Cotinga briefly appeared on a bare branch high above. Before I could really absorb the sight, it dropped out of view. Then a male Serra Antwren started calling just behind me, and it wasn’t long before I had an eyeful of this striking Formicovora species, clearly distinct from the Rusty-Backed Antwren by its black belly. Returning to the monastery at dusk, I surprised several Dusky-Legged Guans at the top of the steps and watched Black Jacobins feed one last time at a flowering tree before dark. Before heading to dinner, I circled around to the goose ponds behind the monastery where a Blackish Rail could be seen walking around on top of the vegetation on the left side of the pond. Early the following morning I was back on the Tanque Grande Trail, grateful for the cold weather, as it seemed to keep the mosquitos at bay inside the forest. In the bamboo understory a group of Ochre-Rumped Antbirds foraged noisily in their territory, and up and down the trail White-Shouldered Fire-Eyes were vocalizing loudly. I found both easily in the growing light. Several times before I went to breakfast I heard White-Breasted Tapaculo calling from well beyond the trail, but then I encountered two separate birds nearly at my feet without having to resort to playback. The first tapaculo must have been a juvenile as its breast was confusingly tawny colored, but the second had a clearly bicolored appearance as well as a cute white eyering. A nice mixed flock included Scaled Woodcreeper, Buff-Browed Foliage-Gleaner, Black-Capped Antwren, Black-Goggled Tanager, and Surucua Trogon, but no Sharpbill. After breakfast I spent several hours birding the bamboo understory on the Cascatinha Trail, finally getting good looks at a male Dusky-Tailed Antbird after nearly thirty minutes of waiting. I also encountered my first pair of Gilt-Edged Tanagers and was blown away by their incredible appearance. The Tangara of Southeastern Brazil must be among the world’s most colorful and intricately patterned birds. In the shrubby Cerrado along the trail, I found another aggressive male Serra Antwren, but failed to see or hear the Green-Backed Becard or Serra do Mar Tyrant-Manakin. Back on the Tanque Grande Trail in the evening, I had a similarly brief encounter with a Swallow-Tailed Cotinga and then watched as a flock of large swifts swooped overhead after coming from the rocky cliffs in the distance, either Biscutate or White-Collared Swifts (it was too difficult to discern whether the white collar was complete). Before calling it a day, I wandered around the Emporer’s Bath area and confidently identified Planalto Tyrannulet with the help of my iPod. The following morning on the Tanque Grande Trail was slow, but I picked up a few new birds, including White-Throated Woodcreeper, Pallid Spinetail (a pair was vocalizing high in the canopy), Blue Manakin, and Hangnest Tody-Tyrant. I also came across a leaftosser in the semidarkness on the trail, but I wasn’t able to identify it any more specifically as it fled into the forest. Walking back for breakfast, I found a tanager flock with two more Atlantic Rainforest endemics, the Golden-Chevroned and Brassy-Breasted Tanagers. A final short walk down the Cascatinha Trail yielded a classic birding moment: first a Slaty-Breasted Wood-Rail came sauntering right up the trail, and then as it careened off into the forest, a Rufous Gnateater dropped down on the dirt nearby and hopped around like an antpitta before perching in a nearby tree for photographs. Before I was done with the gnateater, I noticed a feeding manakin nearby, which proved to be a female Pin-Tailed Manakin. This tantalizing sequence of birds made me realize that I could have spent another few days happily birding the reserve. Notable birds seen: Dusky-Legged Guan, Blackish Rail, Slaty-Breasted Wood-Rail, White-Eyed Parakeet, Planalto Hermit, Fork-Tailed Woodnymph, Black Jacobin, White-Throated Hummingbird, Surucua Trogon, Scaled Woodcreeper, White-Throated Woodcreeper, Rufous-Capped Spinetail, Cinereous Spinetail, Gray-Bellied Spinetail, Pallid Spinetail, Buff-Browed Foliage-Gleaner, Variable Antshrike, Plain Antvireo, Black-Capped Antwren, Serra Antwren, White-Shouldered Fire-Eye, Ochre-Rumped Antbird, Dusky-Tailed Antbird, Rufous Gnateater, Blue Manakin, Pin-Tailed Manakin, White-Winged Becard, Planalto Tyrannulet, Hangnest Tody-Tyrant, Yellow-Lored Tody-Flycatcher, White-Throated Spadebill, Cliff Flycatcher, Velvety Black Tyrant, Long-Tailed Tyrant, Masked Water-Tyrant, Swainson’s Flycatcher, White-Bellied Warbler, Red-Eyed Vireo, Rufous-Browed Peppershrike, Black-Goggled Tanager, Ruby-Crowned Tanager, Burnished-Buff Tanager, Gilt-Edged Tanager, Brassy-Breasted Tanager, Magpie Tanager, Sayaca Tanager, Golden-Chevroned Tanager, Red-Legged Honeycreeper, Blue-Naped Chlorophonia, Purple-Throated Euphonia, Green-Winged Saltator, Lined Seedeater, Crested Oropendola.